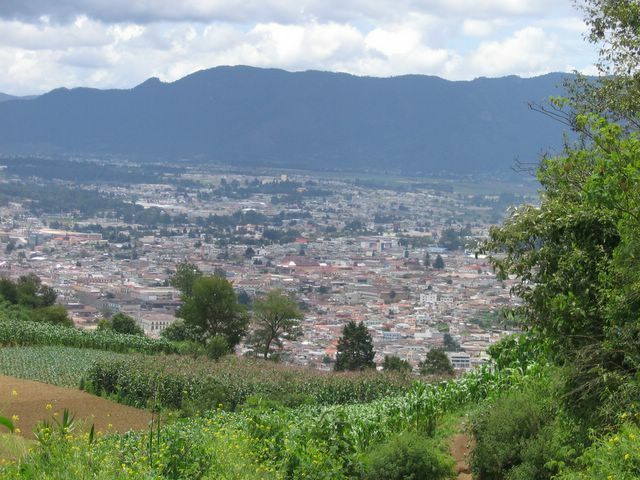 Rob and Carley: QUETZALTENANGO (XELA) - OUR HOME! 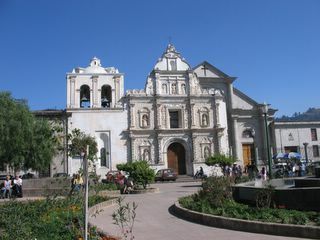 The dominant 16th century church next to Xela's central park. Located in the western highlands of Guatemala, Xela (pronounced SHAY-la) is the 2nd largest city in Guatemala. Still it has the feel of a small city (there are only around 100,000 residents) and it’s a fraction of the size of the capital, Guatemala City (around 3 million), with much less crime. 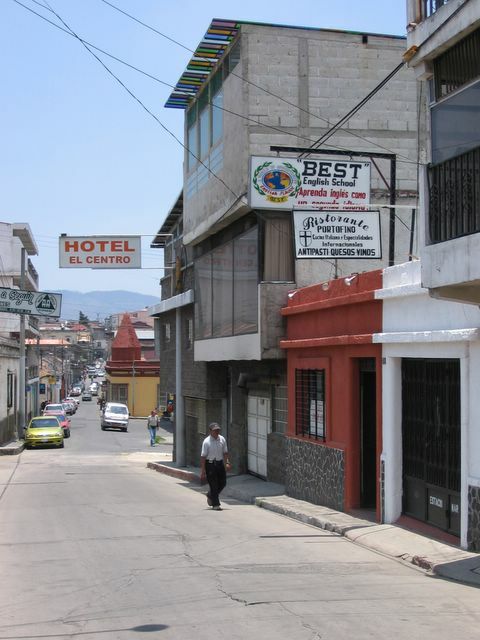 Situated around 7000 feet in elevation, Xela has surprisingly cool weather for a Central American country. From what we’re told, it gets bitterly cold in the winter. Located in the vicinity of several large volcanoes, the area offers some excellent hikes and natural beauty. Since we’ll be here for probably a year, we intend to explore as many of the regional highlights as we can. A view of Xela from a nearby hill. 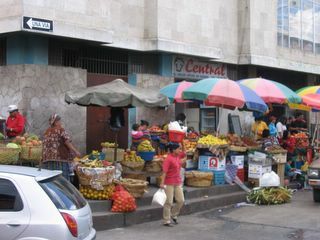 The area around the city is farmed almost everywhere, as the country has a bit of an overpopulation problem. 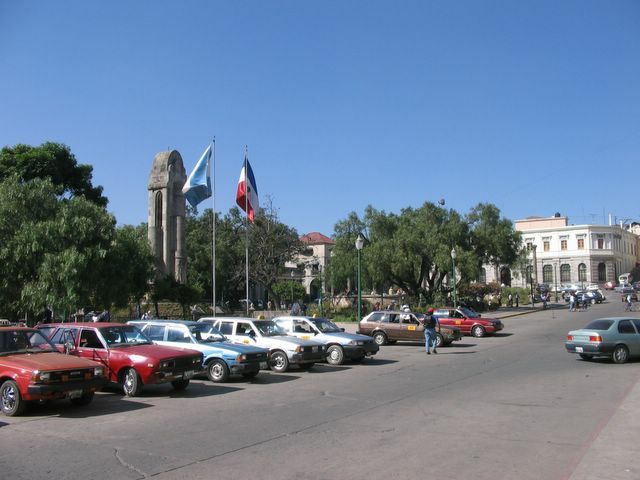 Parque Centroamericana, the central plaza in downtown Xela. 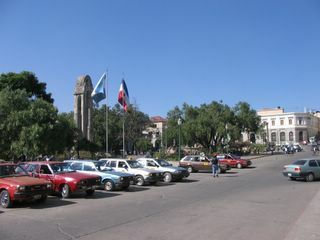 The view from the central plaza in downtown Xela. Up on the hill are great scenic vistas, and beyond are the volcanoes. While not a huge tourist draw, Xela does have a somewhat international flavor these days, due to its reputation as one of the cheapest places in the world to learn Spanish. 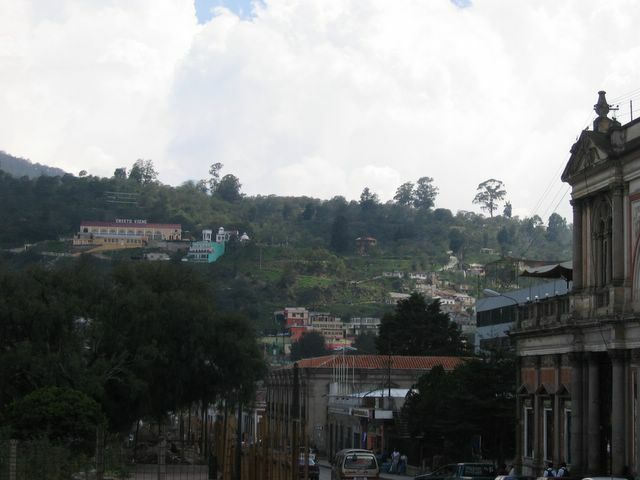 (Guatemala is, after all, one of the western hemisphere’s poorest countries.) The city has probably close to 3 dozen Spanish language schools, and travelers come from all over the world to undertake the full-immersion method of learning Spanish, which often includes a home-stay with a Spanish-speaking family. 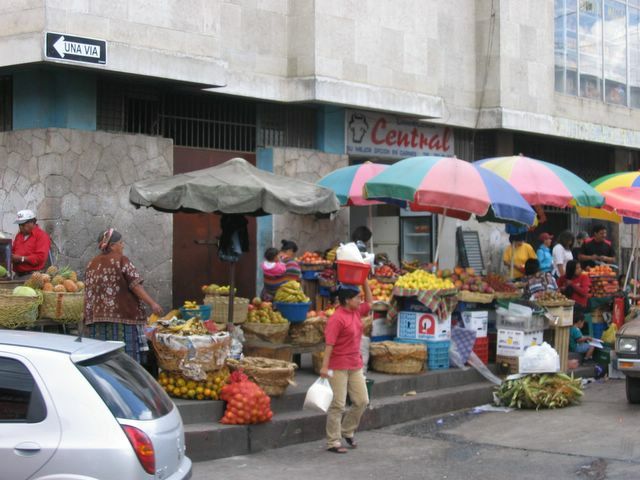 Thanks to all these budget-minded travelers, there is a variety of non-Guatemalan food here, with a heavy influence of Dutch and Italian-owned establishments. Items like hamburgers, pizza, lasagna and waffles are readily available, and there is also a decent selection of vegetarian fare in the restaurants. 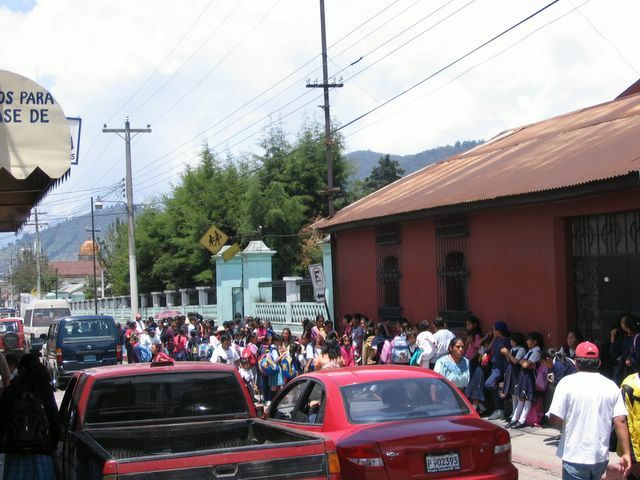 BEST English School, Rob's first employer in Guatemala. For the first 2 months we were here, Rob spent his weekdays here providing English lessons to aspiring Guatemalan (and, would you believe, Japanese!) students, mostly young adults. Next door is Ristorante Portofino, which served excellent Italian cuisine on the occasions we've eaten there. (However we've heard they have a new chef now, and things have changed.) Both the school and restaurant are owned by the esteemed Joel Maldonado. 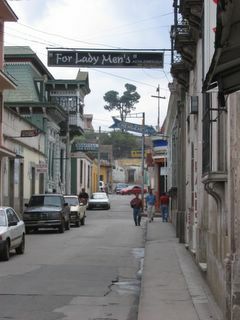 A couple blocks from our house is one of the funnier signs in Xela. This store needs English lessons! Despite the blossoming traveler scene here, you really get a feel for the cultural stew that comprises Guatemalan society. 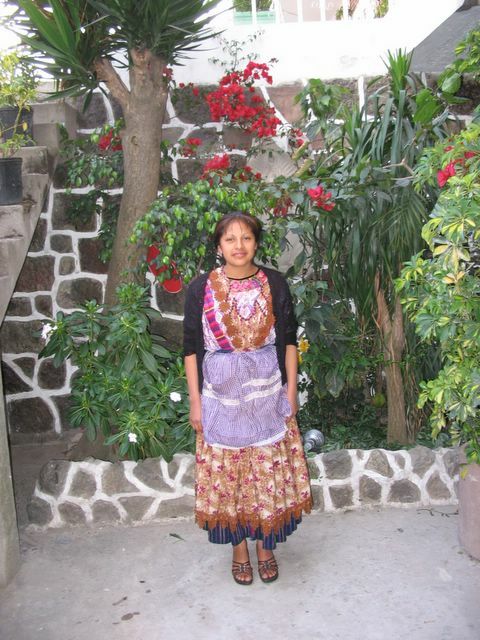 Over half of Xela’s population is Quiché (K’iche’) Maya, and many of the women still wear the traditional style of dress. 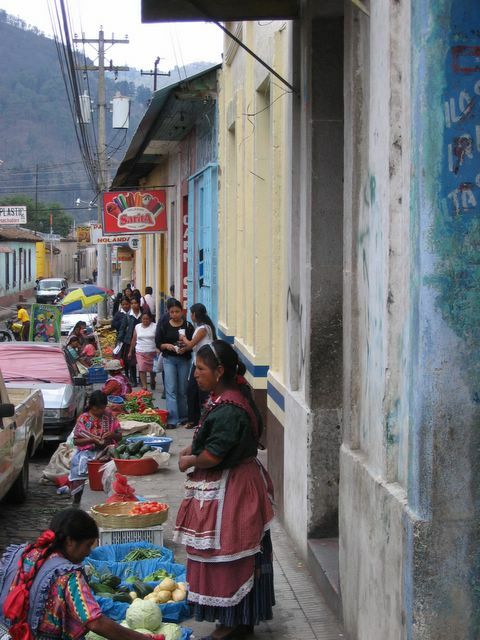 And much like the smaller cities and towns of Mayan Guatemala, impromptu markets spring up on various sidewalks, with vendors selling all sorts of produce, snacks, clothing and crafts. 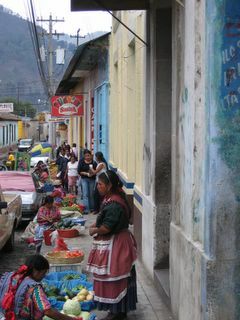 A sidewalk market in Xela. 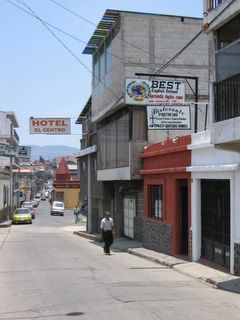 We spent our first week and a half in Xela in the budget traveler’s favorite hostel, Casa Argentina. While the staff was very nice, hostel life started testing our patience when anything we dared place in the disgusting communal refrigerator tended to disappear within hours. We knew we had to find a more permanent housing solution. Initially, we wanted to live in the apartment complex that houses Entremundos, a bilingual newspaper that addresses political, social and cultural issues nationally and internationally. 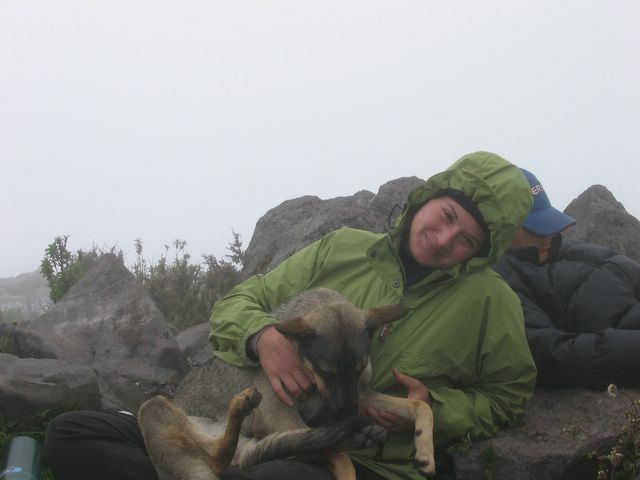 (Carley was thrilled to find an editorial on John Negroponte’s nomination as DNI in the current issue of Entremundos, and we became fast friends with Julie, the editor, who happens to be a San Francisco native and has a dog that looks a lot like Kina.) Sadly, there were no rooms available at the time at Entremundos. Fortunately, we discovered a room opening at another communal living space called the Yoga House, which has turned out to be a fantastic living situation for us. 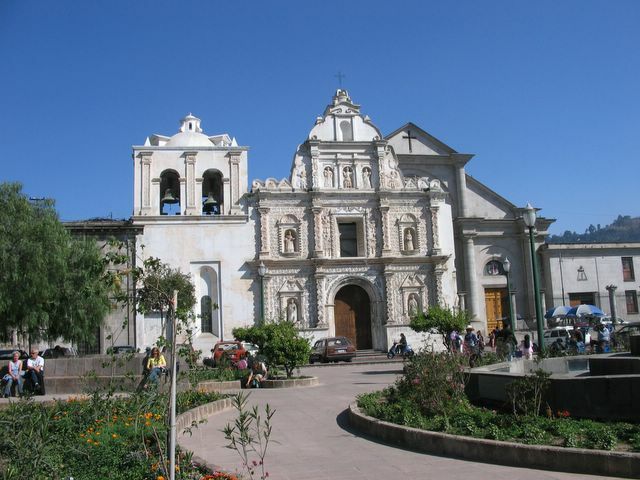 You can learn more about Xela and the many things it has to offer at this website http://www.xelapages.com run by fellow gringos from California.